There is something about neon colors that I will forever associate with that great decade we call "The 80's". I was still pretty darn young during the 80's, but I definitely remember the freedom of style back then. I even had my very own pair (or two) of fluorescent socks! When I saw this sweater hanging up on the wall at H&M, I just had to have it. I bought it a size bigger than I usually wear in large, but I would have loved it even more if it were an XL. 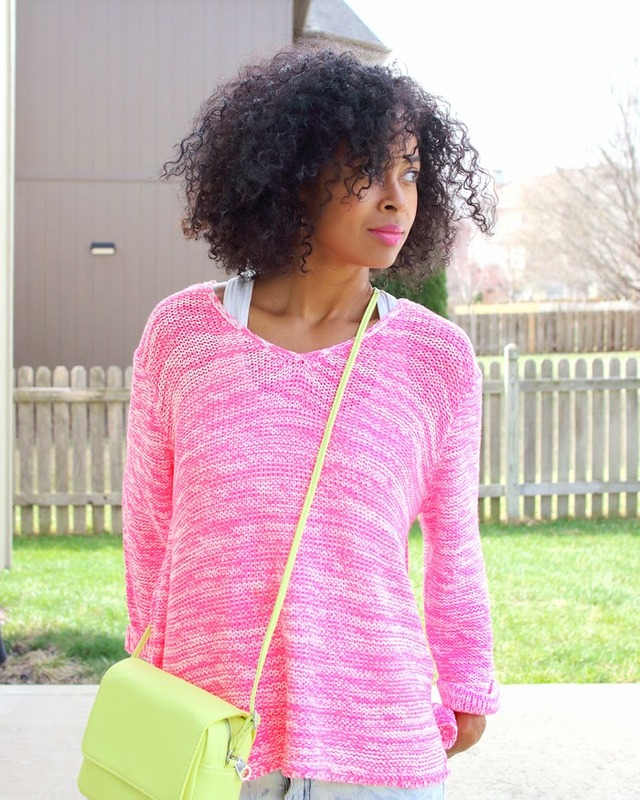 I think this neon yellow bag and my ballet flats complete my modern 80's look. And yes, I'm wearing those jeans again. They're one of my faves, what can I say? Hope April has started out fantastic for all of you! Gorgeous, neon colors look good on you. Rock the 80's! Very Cute!! I remember i had some shoes like those back then!!! Love it!! Such a gorgeous sweater and color! Loving your lip color too! Pink is a fabulous color on you. I love this lip color on you! I love all the color!!! !